Let's get this part out of the way: She knew and we knew that it was going to be an emotional performance for her. She had already mentioned that there were a few reasons she might cry: She's pregnant; she had written this song when she was pregnant with her first child, so there was nostalgia there; and there was additional nostalgia in the fact that she was the first winner on Idol and now she's performing in the final season. Now let's talk about how she demonstrated professionalism. 1. How did she know she was going to cry? Well, she rehearsed! 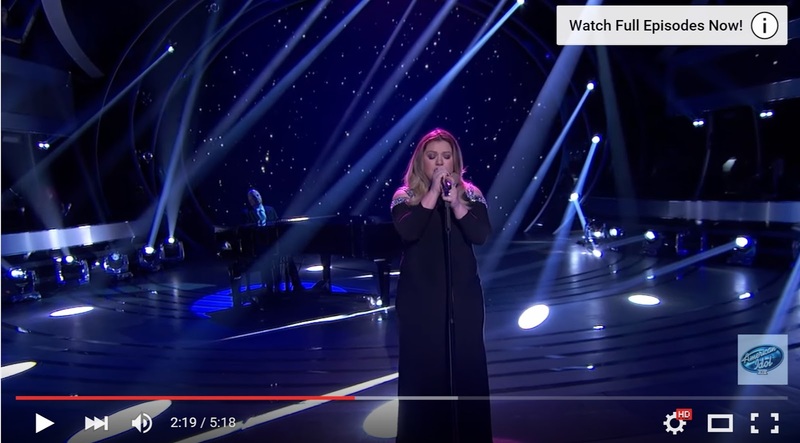 Do you think Kelly Clarkson ever wings a performance? Absolutely not. 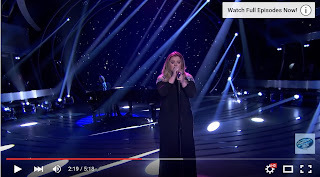 She had most certainly rehearsed this performance and had already found it emotional. She was prepared! 2. She created a song and a performance that she knew would connect with the audience in the first place. If you've seen her performances, you know she gives 100% to connecting with the words and with the audience. She never goes through the motions, even when she's performed a song hundreds of times. 3. When she began to be overcome with emotion, she breathed through it. She took her time, but she didn't let it stop her. She remained committed to the performance. 4. On a side note, not about Kelly, pay attention to the band. They are absolutely 100% in tune with her. She pauses, she sings. She breathes, she sings. Talk about professionalism: They stayed with her till the end, never missing a beat or a note. I can't imagine how difficult that must be, but again, this is about rehearsal, preparation and commitment. The band never wavered, even while Kelly was taking unpredictable pauses. Look back at my recent post on "winging it." You can show up and give a committed and well-prepared presentation, like Kelly Clarkson did, and your audience will be talking about you for days, weeks and even years. Or you can show up and throw away your opportunity to make an impact by not preparing and not caring, and your audience will forget about you minutes later. It's your choice.